Brand new with tags. Knitted, seamless. 100 % Authentic Original from a Nike Outlet. Any questions please ask. Return accepted if not happy with. Please have a look at my other authentic Nike items. Thanks for looking! Under Armour Golf/Running Zip neck top Navy Blue Size Large. Condition is Used. Dispatched with Royal Mail 1st Class. Thin sweatshirt. Slightly elasticated cuffs. Peter Millar Wentworth Golf club t-shirt. New with tags. 100% cotton size: XL. Condition is New with tags. Dispatched with Royal Mail 2nd Class. A cracking addition to any golfers attire for the trek round the 18 holes. The jacket has been worn but it is still in perfect condition. HIGH QUALITY. Size: Large. GET IT FAST! Armpit to armpit: 23". Brighton. And Hove Albion Golf Top adult medium. Condition is Used. Dispatched with Royal Mail 2nd Class. Features the 3 stripes on sleeves. Red piping on back and inside collar. The classic Adidas logo on chest in grey. HIGH QUALITY - stretchy feel. Perfect, like new. Size: Large. GET IT FAST! Puma Golf Mens PwrWarm Extreme WarmCELL Quilted Hybrid Jacket . Condition is New with tags. Dispatched with Royal Mail 1st Class. This is a very attractive top from the Dri-Fit range produced to keep you warm and comfortable on the golf course. Aertex Polo Sports Top - Size L - White with green stripe and pocket. Condition is Used. Dispatched with Royal Mail 2nd Class. 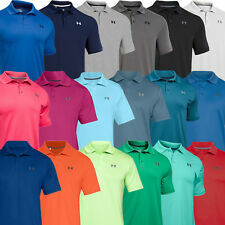 Under Armour Mens Heatgear Size XL Loose Fit Golf Polo Shirt. Condition is used but unworn.